As usual, I left my backpack under the seat. 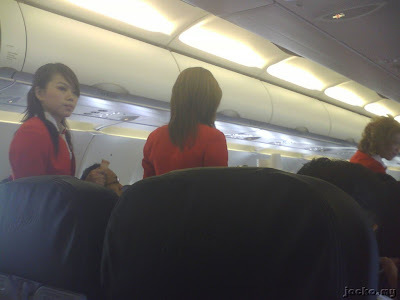 A pretty flight attendant Miss Tay Pei Pei came to me: “Sir, you can’t leave your bag under the seat for row 12 and 14. 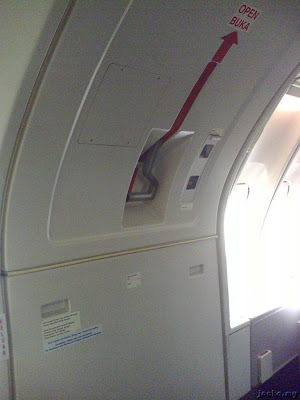 This is because it’s at the emergency exit.” Ok, this was the first time I ever encountered this. Of course I obeyed what the pretty said. After 10 minutes, the airbus was ready to take off. 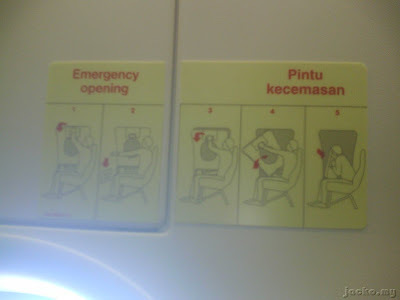 “You need to open the door during emergency. You need to help others bla bla bla… … Please make sure outside is clear off hazards before you open the door. Thank you for your attention.” With her sweety voice, we were briefed on how to operate the emergency exits. Wooo... Everyone's life is in my hand! Now my responsibility is very big, I have to be the "emergency safety warden" when something happens. Hmm... may be I even need to sacrifice myself!! LoL. Touch wood. I quickly checked on the safety leaflet. 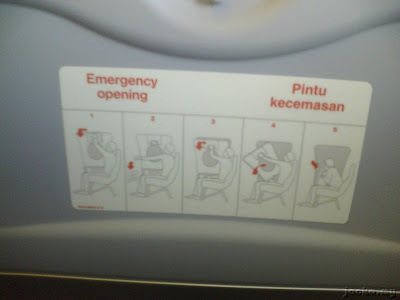 Ok, I was at Exit B (the middle one, right at the wings), and now how to open the door? 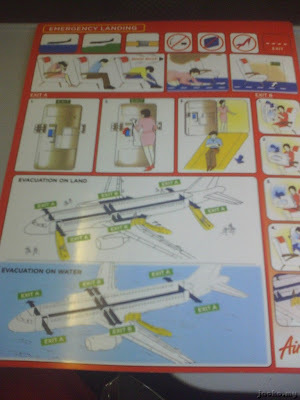 Now I felt more safer to travel with AirAsia, thanks to the complete safety instruction from Miss Tay, and complete leaflet for instruction. Meaning that, AirAsia is cheap, but they do not compromise the safety, hopefully they do take care and inspect the airbus the same way. I am a frequent business traveler, long haul to another mainland, the USA almost every quarter. 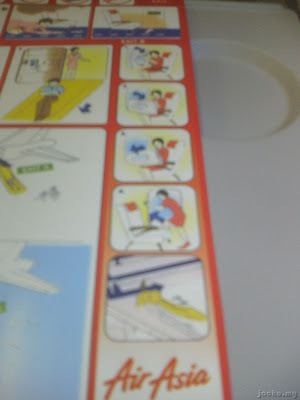 I always pick my favorite seat which is the row right after the emergency exit, as you can see above. As I was told by the national airline ground staff, this row is not available for reservation and I need to be the emergency safety warden if I sit at the row. However, there is no leaflet to guide me how to operate the door, there is no additional briefing, there is no whatsoever to let me know what to do during emergency. 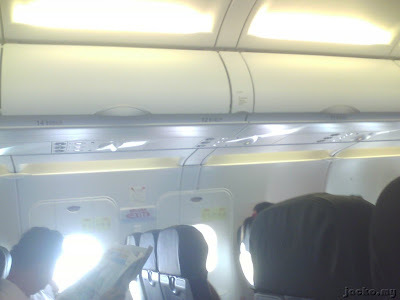 So, what makes the difference between a budget airline to carry out the safety precautions so serious, whereas the normal airline does not do the same? Different modus operandi? 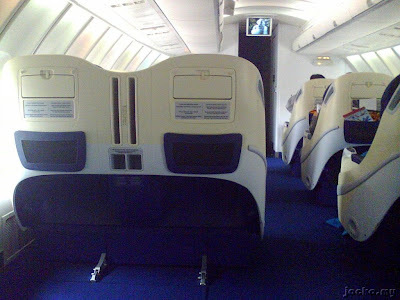 Different class (I am on business class when travel to USA)? Or different plane model which Boieng models are more advanced than the airbus, and perhaps the exits open automatically no matter how? Anyway, since I am now safely touched down at the island, who cares so much (my who-care attitude again! Haha!)? Let's enjoy my free and easy vacation in Labuan and Kota Kinabalu (KK)!! New Discovery @ USJ 14! International Olympic Committee Contacted Me!